We’ve seen the pictures of Sophia’s supposed unibrow and honestly we think she’s just as adorable as ever! 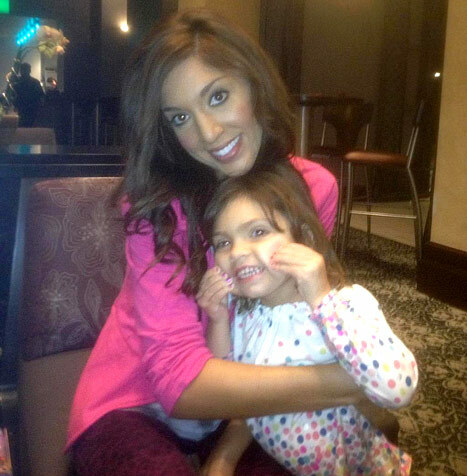 Farrah is so obsessed with physical appearance, that she’s now taking her insecurities out on her daughter. The 20 year old aspiring model recently went under the knife receiving a breast augmentation increasing her cup size from an A to a C. She also underwent $16,000 surgery in the form of rhinoplasty and a chin implant. It’s no wonder she’s moved on to Sophia, she doesn’t have anything left to fix on herself! Obviously Farrah’s obsession with image is beginning to affect her daughter, we hope she can figure things out for herself soon.